On Monday, I set out to run 4 miles. It was hot and humid and I was glad to be done. But on Wednesday, I woke up to 52 degrees! Thank you Mother Nature. I did 6 miles on the bike path and hit paces I haven't seen since last spring. This may sound odd, but I felt like I was actually running. As opposed to jogging or wogging. Saturday was even better. It was 42 degrees when I did my 3.1 mile run. My legs wanted to go and I let them. I only stopped to take a picture. No walking. This.felt.great. I haven't seen paces like that since last spring. If I needed proof that it really is the heat and humidity, I got it with this run. It is so nice to know that all the difficult runs I had this summer were worth the effort. Just like money in the running bank. I was excited to go back to work with Coach Sammy Jo. 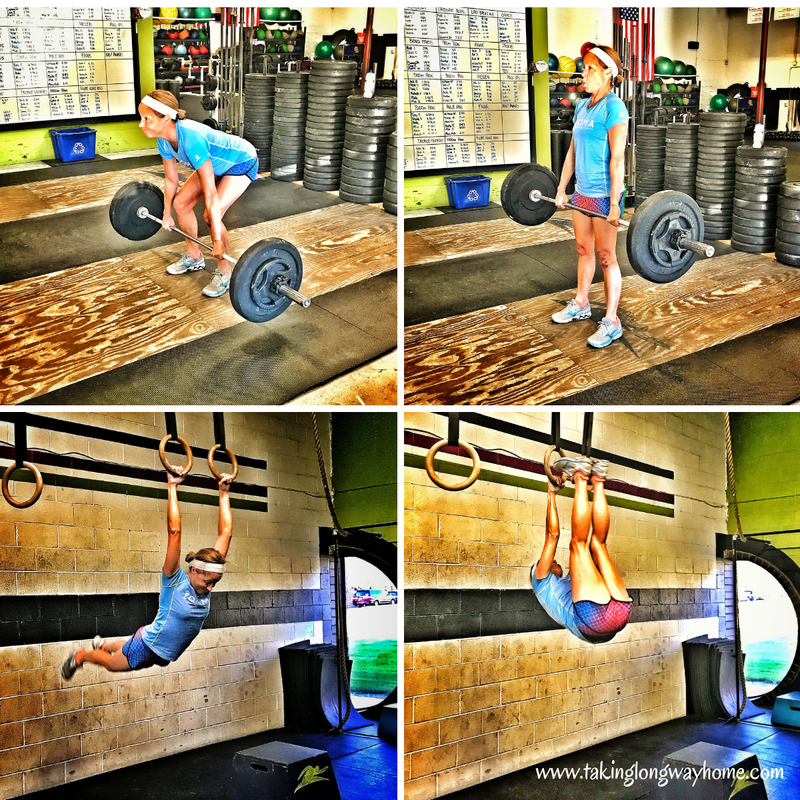 For strength, she had me do 3 sets of deadlifts x 8 reps. After that I did barbell rows alternating with toes to rings. Then we worked on handstands. I also did bootcamp which was full of fun activities like plate flips, overhead plate lunges, and hollow hangs. We ran. We snatched. We box jumped (well, some of us stepped up). We push pressed. We burpeed. We finished up with jump ropes. And we sweated. I did yoga twice this week. On Monday, I did Five Parks Yoga Deep Stretch for Hamstrings and Hips. 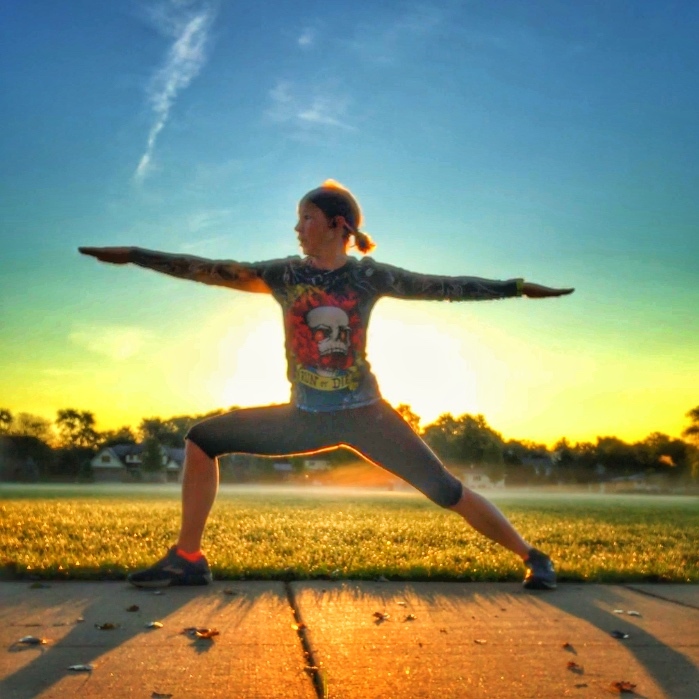 On Wednesday, I tried something new and different: Lululemon's 20 minute Post-run Yoga with Faith Hunter. I completely enjoyed this one and will do it again. On Saturday, my husband, oldest son, and I drove to Madison to watch my Badger play his first Big 10 home rugby match. The Badger Rugby Club is ranked 22 in the nation (Div D1A) right now and both the A and B teams crushed Michigan, 76-7 and 44-7, respectively. I do love watching him play. What a fun day! I just love the intensity in their eyes! 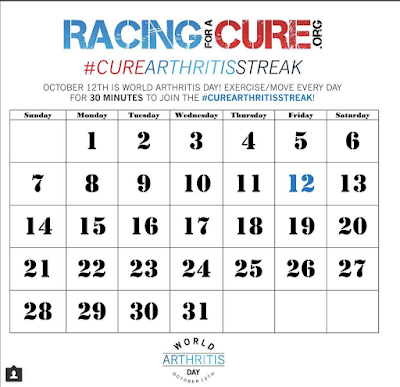 For the month of October, I'll be participating in Racing for a Cure's #curearthritisstreak. 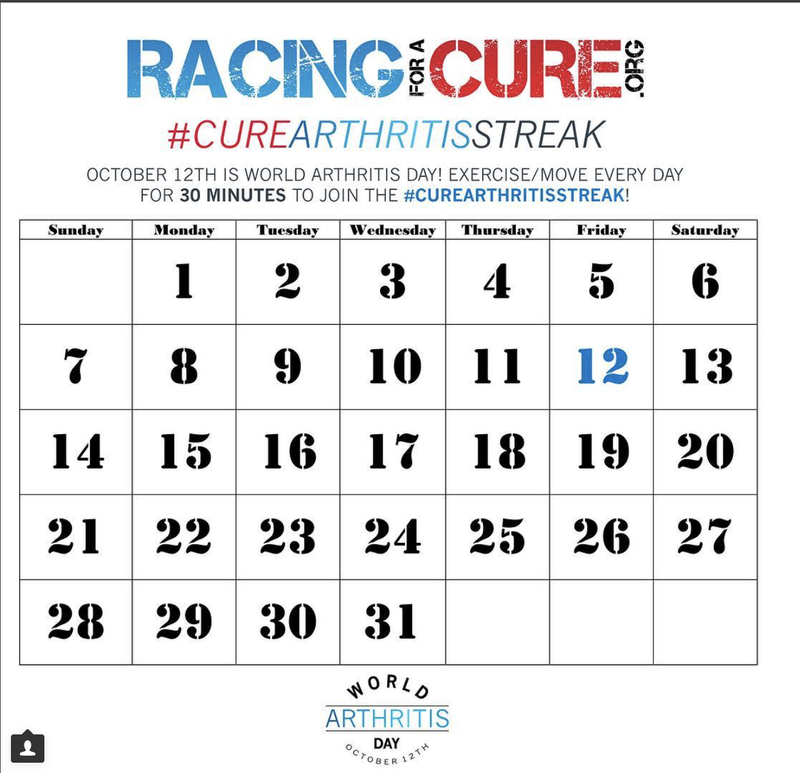 October 12 is World Arthritis Day and we've been tasked to move for at least 30 minutes every day for the entire month to help increase awareness of the need to help cure rheumatoid arthritis as well as other autoimmune and inflammatory illnesses. I'll be posting my workouts daily using the hashtag. If you want to join in or want more information, check out busylizziesf's IG! This is the most fun party in town--where the cool fitness bloggers come to link up the workout and/or race recaps. The rules are simple (see the tab above) and based on reciprocation. Sharing is caring. Please link back to Holly and me and comment on our blogs. 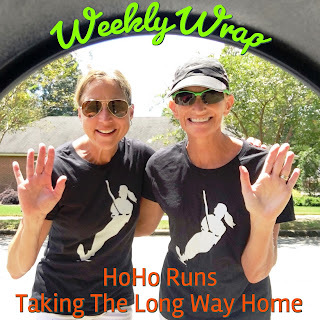 Thanks so much for participating in the Weekly Wrap! Yay for the awesome runs! I agree cooler weather makes a huge difference. It makes me WANT to run again. Yay for the Badgers rugby wins! How fun to watch. It's so fun to be on the sidelines and watching him play, especially at this level. I kind of can't believe it! A great week, I'm so pleased for you! It's soooooo nice now the temps and humidity have dropped, isn't it. What a relief! I'm getting used to running continuously and even - shock - wearing two tops again. Hooray! Toes to rings? It's so invigorating. The first couple of times I did it, I felt butterflies in my stomach! So glad you are feeling better thanks to the cooler weather! I've noticed a difference too, and it only got down to the high 50s here. Hope it continues! There's a bunch of lulu yoga videos--I was surprised. I'm going to try some more. I need to share the Arthritis Streak with my dad! He suffers from really bad arthritis in his hands and knees, but is always looking for ways to stay active and moving. It's a good incentive to keep moving. I absolutely know what you mean about wanting to run - such a good and truly restorative feeling. Loving this weather, even though I plan to take some down time this week. I'm loving the cooler temps. I feel like a runner again! I'm glad you had a better week and you seem to have gotten your mojo back! I'm really hoping the Schaumburg Turkey Trot will work out for me! I hope so!!! It would be so fun! Good weather makes such a huge difference! Glad you were itching to get out for a run again. I'm now obsessed with the weather forecast for my race next weekend to see what we're going to get. It's so crazy this time of year. We're supposed to be back in the 80s by Wednesday. I agree on running is actually feeling like running again after the slog of summer. And I fully support cool in the morning and a nice warm up during the day. If only it would stay like this! I am all in for this cooler weather. Summer was a hot one. How fun to go see Matt! We're heading back up there this weekend--they play against Indiana! Totally in the same boat this week with the awesome running temps. All of a sudden I am feeling much more 'normal.' It's wonderful! But it is unfortunately short-lived...I need to move somewhere with these temps all year. San Fransisco maybe? Oh, I'd be all over SF! Unfortunately my temps went in the opposite direction, but them we went almost 300 miles south! Cool mornings & warm afternoons would be awesome! Let's all band together and protest Mother Nature! 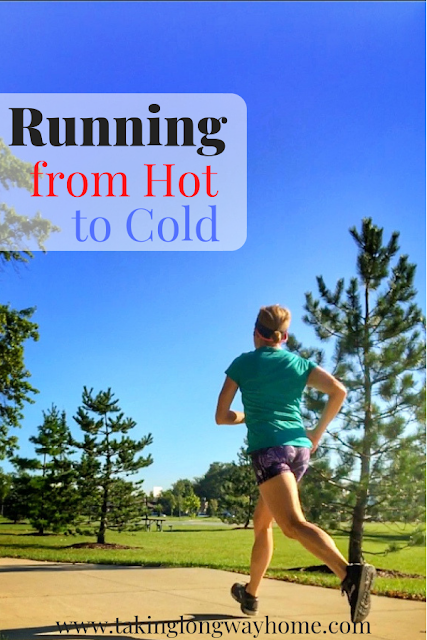 I think you already know that I prefer cold to warm weather when it comes to running! That #CureArthritisStreak is such a great idea and it will bring even more attention to the cause. I needed a change of pace and I was pretty excited to find Lulu had a bunch of new videos. I think they are really trying to do the running/yoga combo. Glad you finally got a break from the heat! It really does make such a difference in how runs feel. It was incredible--I've never noticed such a difference before. Heat and humidity are totally pace killers! I had a really great race this weekend but I'm sure I had more in the tank and could have totally killed it even more had it not been so hot. Being the temps it was though, I'm really happy with my performance. Glad running was easier for you this week! I'd love to see temps below 70 right now. I ran this morning and it was cool, but it was 92% humidity and that really slowed me down! Baby steps, right? I totally get what you mean about runnung vs joggimg- I've had a few runs like thst over here lately, too! Not all of them, but when I actually get a good night's sleep and the weather's cool, occasionally I'll get a good run! It feels good to RUN! I’m so glad your running feels better with the cooler weather. I hope mine does the same if it ever cools off! I love that you are close enough to get to your son’s games (matches?) easily. It’s exciting that they play so well. You know I'm loving this. It's a 2 hour drive which I make gladly! What a cool rugby action shot. I know you're a proud mama! I'm so happy you were blessed with some great weather and could enjoy those speedy, confidence-boosting runs. I'll just have to live vicariously through you for a while. We're going to be up and down for the rest of the week. I'm not expecting anything spectacular like last weekend! PS I couldn't find anywhere to comment on your blog. 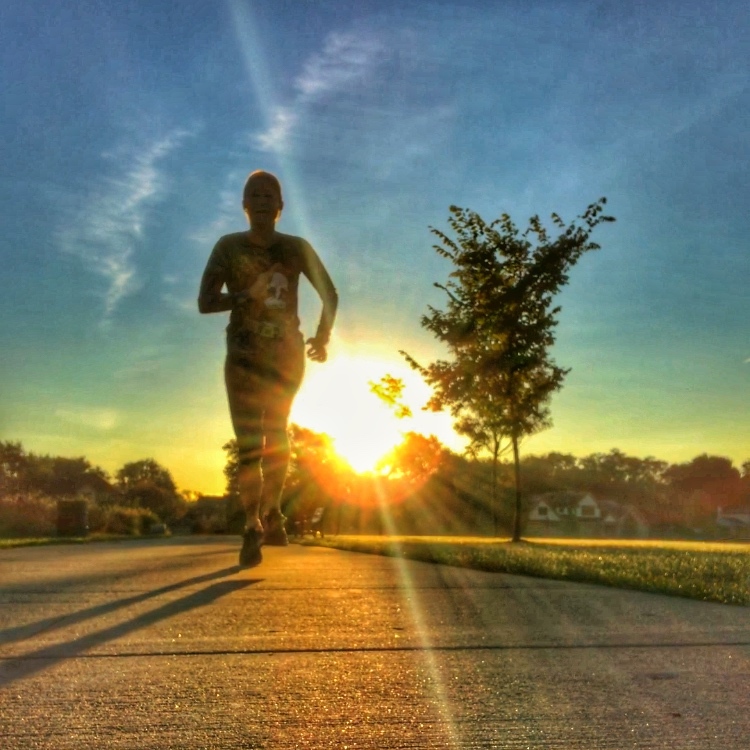 There's nothing like that cooler running weather to bring your confidence back! I'm glad that you had some really solid runs this past week. And I am always in awe of you on those rings! Congrats to your son! I was so ready to quit until this week. I so needed it! 40 degree drop? That changes everything! I think we've had a 4 degree increase! It's insanity! I'm so hot! And I'm tired of being sweaty all. the. time! Your ring work is beyond! Your strength is always so very inspiring. Oh thank you--I love what I do at the box. It's the one area that I'm actually making gains. You had a great week! I'm so happy to see you killing it and feeling so good while doing it. It was 60° this morning when I ran and even though I didn't check, I could tell the humidity was quite a bit lower. And yes, I hit paces I hadn't hit in quite a while, too. Isn't it fun going to see your college kid? I loved those weekends! I just love going up there. Once he's done playing for the season, i'm going to have to find a different excuse! Ahhh, cool running weather - so jelly over here! Glad you got your running mojo back with the wonderful weather. It was just what I needed. I am so glad it's still in me! Your toes to rings are GOALS!! We've had a little break in the weather too - not as significant as yours - and the mornings have been so much nicer! I've got my fingers crossed hard that these temps hold (or maybe even get a little cooler) for my race in a couple of weeks! I hope it's cooler for your race too! Great that you had some good runs this week! Let's hope we're finally done with heat and humidity once and for all! I bet you had a blast watching your son play - love rugby! It's been ages since I've seen a game live. We're getting a few hot days here and there--tomorrow included. I've got to get out early! It's still summer here. Triple digit heat indexes and temps in the 80s and 90s. I'm jealous of your cooler weather. It really does make a huge difference. Come January, you can make me jealous with your tolerable winter temperatures! That rest that you took did a lot of good for your body, and really showed with how your workouts went last week. Way to go! My coach takes some nice photos for me!